Manzanera JA, Gómez-Garay A, Pintos B, Rodríguez-Rastrero M, Moreda E, Zazo J, Martínez-Falero E, García-Abril A (2016). Sap flow, leaf-level gas exchange and spectral responses to drought in Pinus sylvestris, Pinus pinea and Pinus halepensis. iForest 10: 204-214. In a climate change scenario, Mediterranean forest species such as pines may be endangered by rising temperatures and reduced precipitation, thus calling for studies on the transpiration and water balance in pines. In this paper, the response of young plants of Pinus sylvestris L., Pinus pinea L. and Pinus halepensis Mill. to different irrigation treatments has been studied. Significant differences were found in water potential, sap flow, leaf-level gas exchange and spectral variables. P. sylvestris had higher pre-dawn and midday water potentials, sap flow rates and leaf-level gas exchange rates compared to the other two species in well-watered conditions. Vapor pressure gradient correlated with stomatal conductance, net assimilation and transpiration, but the association between stomatal conductance and sap flow was weak. The environmental variables more strongly associated with sap flow were solar radiation and reference evapo-transpiration, especially in the well-watered plants, but those associations were weaker in the stressed plants. All three pine species showed the isohydric, drought-avoiding strategy common in the genus Pinus, maintaining relatively high water potentials in dry conditions. Nevertheless, P. halepensis showed a water-saving strategy, with a stomatal closure behavior under drought. Stomatal regulation was less strict in P. sylvestris, closer to a water-spending pattern, while P. pinea showed an intermediate behavior. Significant differences were recorded among species in spectral reflectance in the visible and infra-red regions. Photochemical Reflectance Index, Normalized Difference Vegetation Index and combinations of other ratios permitted the discrimination among the three pine species. These spectral variables showed association with sap flow rate, water potential and leaf-level gas exchange variables. Both cluster analysis and k-means classification discriminated Scots pine and Aleppo pine in two different groups. On the other hand, Stone pine showed differences in spectral behavior depending on the hydric status of the plants. Well-watered Stone pine plants had the same spectral behavior as Scots pine, while the plants subjected to drought stress were closer to Aleppo pine plants in spectral response. These findings may help to quantify the impacts of early and mid-summer water deficit on Mediterranean pines in future climate regimes. Comparative ecophysiological effects of drought on seedlings of the Mediterranean water-saver Pinus halepensis and water-spenders Quercus coccifera and Quercus ilex. Trees - Structure and Function 20 (6): 689-700. Canopy transpiration of a Pinus canariensis forest at the tree line: implications for its distribution under predicted climate warming. European Journal of Forest Research 133 (3): 491-500. Response of vegetation indices to changes in three measurements of leaf water stress. Photogrammetric Engineering and Remote Sensing 57 (2): 195-202. Seasonal variation in canopy reflectance and its application to determine the water status and water use by citrus trees in the Western Cape, South Africa. Agricultural and Forest Meteorology 151 (8): 1035-1044. A rate equation model of stomatal responses to vapour pressure deficit and drought. BioMed Central Ecology 2: 8. Reflectance assessment of seasonal and annual changes in biomass and CO2 uptake of a Mediterranean shrubland submitted to experimental warming and drought. Remote Sensing of Environment 90: 308-318. The Photochemical Reflectance Index (PRI) and the remote sensing of leaf, canopy and ecosystem radiation use efficiencies: a review and meta-analysis. Remote Sensing of Environment 115: 281-297. Decadal water balance of a temperate Scots pine forest (Pinus sylvestris L.) based on measurements and modeling. Biogeosciences 7 (4): 1247-1261. The influence of soil salinity, growth form, and leaf moisture on the spectral reflectance of Spartina alternifolia canopies. Photogrammetric Engineering and Remote Sensing 49: 77-83. Assessing structural effects on PRI for stress detection in conifer forests Remote Sensing of Environment 115 (9): 2360-2375. The response of Pinus sylvestris to drought: stomatal control of transpiration and hydraulic conductance. Tree Physiology 18: 393-402. PROSPECT + SAIL Models: a review of use for vegetation characterization. Remote Sensing of Environment 113: 56-66. Hydraulic adjustments underlying drought resistance of Pinus halepensis. Tree Physiology 31 (6): 637-648. Ecophysiological competence of Populus alba L., Fraxinus angustifolia Vahl. 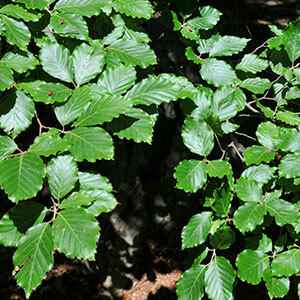 and Crataegus monogyna Jacq. used in plantations for the recovery of riparian vegetation. Environmental Management 40 (6): 902-912. Functionality indicators for sustainable management. In: “Quantitative Techniques in Participatory Forest Management” (Martinez-Falero E, Martin-Fernandez S, Garcia-Abril A eds). CRC Press, Boca Raton, FL, USA, pp. 241-261. Assessing gas exchange, sap flow and water relations using tree canopy spectral reflectance indices in irrigated and rainfed Olea europaea L. Environmental and Experimental Botany 99: 43-52. The hydraulic architecture of Pinaceae - a review. Plant Ecology 171: 3-13. The effect of vapour pressure on stomatal control of gas exchange in Douglas fir (Pseudotsuga menziesii) saplings. Oecologia 54: 236-242. The effect of water stress on photosynthesis and related parameters in Pinus halepensis. Physiologia Plantarum 64: 295-300. Allometric equations for crown fuel biomass of Aleppo pine (Pinus halepensis Mill.) in Greece. International Journal of Wildland Fire 16: 642-647. Hydraulic properties of Pinus halepensis, Pinus pinea and Tetraclinis articulata in a dune ecosystem of Eastern Spain. Plant Ecology 169: 131-141. Photochemistry, remotely sensed physiological reflectance index and de-epoxidation state of the xanthophyll cycle in Quercus coccifera under intense drought. Oecologia 156: 1-11. GEMI: a non-linear index to monitor global vegetation from satellites. Vegetatio 101 (1): 15-20. Drought-induced defoliation and long periods of near-zero gas exchange play a key role in accentuating metabolic decline of Scots pine. New Phytologist 200 (2): 388-401. Effectiveness of the photochemical reflectance index to track photosynthetic activity over a range of forest tree species and plant water statuses. Functional Plant Biology 38 (3): 177-186. Optimization of soil-adjusted vegetation indices. Remote Sensing of Environment 55: 95-107. Monitoring the vernal advancement and retrogradation (Greenwave Effect) of natural vegetation. Type III Final Report, NASA Goddard Space Flight Center, Greenbelt, ML, USA, pp. 371. Model projections of an imminent transition to a more arid climate in southwestern North America. Science 316: 1181-1184. Estimating reference evapotranspiration with hourly data. In: “California Irrigation Management Information System Final Report” (Snyder R, Henderson DW, Pruitt WO, Dong A eds.). Vol. 1. Chapter VII Land, Air and Water Resources Paper 10013-A, University of California, Davis, CA, USA, pp. 1-3. Assessing canopy PRI for water stress detection with diurnal airborne imagery. Remote Sensing of Environment 112: 560-575. Variability among species of stomatal control under fluctuating soil water status and evaporative demand: modelling isohydric and anisohydric behaviours. Journal of Experimental Botany 49: 419-432. Retrieval of foliar information about plant pigment systems from high resolution spectroscopy. Remote Sensing of Environment 113: S67-S77. Sap flow characteristics and whole-tree water use of Pinus cembra across the treeline ecotone of the central Tyrolean Alps. European Journal of Forest Research 133 (2): 287-295. Assessing vineyard condition with hyper- spectral indices: leaf and canopy reflectance simulation in a row-structured discontinuous canopy. Remote Sensing of Environment 99: 271-287.